This scallion-buttermilk dressing is so fresh and vibrant. This is absolutely wonderful on a salad of young lettuce and farm-fresh tomatoes. And we just love this on the Green Bean and Tomato Salad. Wonderfully refreshing! This Scallion-Buttermilk Dressing is so fresh and really vibrant. Similar to classic Ranch with a twist of scallions. Amazing flavors. 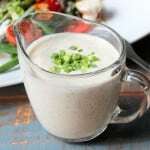 Puree the scallions in a food processor, then add the remaining dressing ingredients and pulse until smooth.